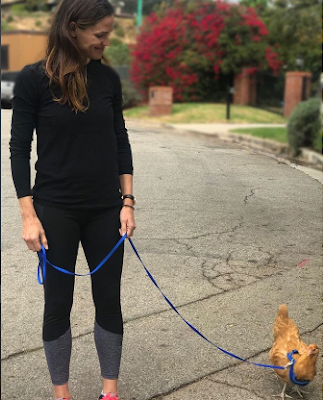 American actress, Jennifer Garner shared this adorable photo with one of her backyard chickens she named Regina George as the two enjoy a stroll together. "If there isn't a Chicken Lady Day, there really should be. Man, my life gets more exciting all the time," Garner joked in the caption. "Meet one of our ladies, Regina George. Regina loves long walks, dehydrated bugs, and kale. 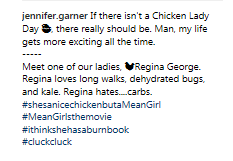 Regina hates....carbs"